Yesterday I mentioned keeping a reasonably well stocked pantry in order to allow for some flexibility in my meal planning. I got to thinking about what a well stocked pantry looks like. It will probably different for every household, and it varies for us as well, depending on season, tastes, moods, how well we stocked up last year, etc. In general, this is what I came up with for our version of a well stocked pantry (in no particular order). Oats – I keep a half gallon to gallon size container of oats on hand at all times. Sometimes I switch between steel cut oats and rolled oats, but I have found that rolled oats are more versatile. These whole grains make oatmeal, of course, but they can be added to desserts (cookies, crisps), muffins, breads, and are the base for home made granola. They are insanely less expensive than boxed cereals, and better for you too. Rice – I use both white and brown rice, and at times I’ve kept quinoa on hand instead. Rice is a great belly filler, another whole grain, and it keeps. Good with stir-fries, in soups and stews, as a side dish, the star of risotto, and Rick even eats it for breakfast with butter and cinnamon. Canned beans – the hero of emergency meals. Dried beans are far cheaper, and we keep them on hand too, but canned beans can be used instantly with no soaking or hours of cooking. We add them to up the protein on pasta dishes and soups, sprinkle them over salads, as easy finger-food lunches for the kids, we let them star in vegetarian meals. Keeping beans on hand saves the day if I forget to defrost meat for dinner. Olive oil & balsamic vinegar – Together, they make an easy, delicious and cheap salad dressing. Separately, olive oil can be used for nearly everything we cook. I do keep other oils on hand too, but if I had to keep only one, olive oil would be it. The balsamic can be used in other ways too. A friend brought over a dessert once of mascarpone cheese spread on sugar cookies, topped with sliced strawberries and drizzled with balsamic reduction (heaven). I use balsamic as a secret ingredient in certain soups and other dishes. Broth – you can’t really make risotto without it and it makes soups super fast. It’s a decent substitute for white wine in a pinch. It’s a fast way to up your flavor without much effort. Canned tomatoes – if I’m crunched for time or feeling lazy, you can bet I’m reaching for a jar or can of tomatoes. They can become anything. I use them for enchilada sauce, pasta sauce, pizza sauce, soup, stew, chilli, roasted with other veggies, you name it. This is a true staple for us. Onions and/or garlic – the other day I told Rick, “We’re out of onions. I can’t make anything without an onion!” I know, strictly speaking, onions and garlic are perishable, probably not really “pantry” food, but stored well, they last a long time and I really feel like I can make anything taste good if I have an onion or garlic. This makes my mom laugh. When I was a kid, I “hated” onions, I even gave my mom a homemade citation for using too many – her punishment was to not be allowed to use them for a whole week. She was a good sport and went along. I pray my children don’t ever punish me this way. You can make rice and beans delicious with a little onion and garlic. If times are tough, and your cupboard is nearly bare, you better have an onion. Dried herbs/spices – I love me some spices. I can’t understand how people cook with nothing but salt and pepper. An average spice rack should at least include thyme, rosemary, oregano, parsley, dill, red pepper flakes, bay leaves, savory, and cumin powder. Mine better have extra red pepper flakes and Chimayo chili powder too. You don’t have broth? Make some with your meat, an onion, a bay leaf and some thyme, parsley, and savory. Chili? You need that cumin and those ground chilies. Rosemary will make your plain ol’ rice and chicken amazing. A bit of dried herbs go a long way, and they can make the most basic of meals delicious. Pasta – Another go-to for us. It’s versatile, cheap, it keeps forever and I can buy it in bulk. Sometimes I feel like the number of pasta dishes is limitless. Soy Sauce & rice vinegar – If you get tired of tomato based dishes, the cure is soy sauce and white vinegar. The combo makes the best fried rice, and you can use them to make many Asian sauces. Soup, Thai, stir fry, peanut sauce, marinade, jerky, the list goes on. Practice using the pair and you can impress anyone. Obviously this list doesn’t cover baking basics like flour, which I almost added to the list. But I’m curious how your pantry matches up to mine. Is it similar? Very different? Did I miss something or surprise you? Does your region or culture affect your list? Tell me what is on your list of pantry staples. I think just about the only thing on this list I don’t keep “stocked” are oats, but I’m thinking of starting to make my own granola, so that may change soon. Since I bake my own bread, flour would definitely be at the top of the list. I also like to keep a shallot or two, and a ginger root along with the onions and garlic. Oh, and I almost forgot! A must have – Sriracha Thai chili sauce – probably the whole family’s favorite way to spice up a dish! Oh, ginger root! Yes! And I love Sriracha. But I love love love hot things. Completely agree about the onion…exact comment I would have made! I’ve been really happy with dehydrated onion in a pinch. Yes – I went for a time without any dehydrated onion and then I had to add it back to our spice cupboard. I prefer a fresh onion, of course, but the dehydrated onion (or garlic) will save the day if you don’t have one. And P.S. your pantry is beautiful. Mine looks like it was stocked by Dennis the Menace. We can’t eat a lot of carb foods so our “pantry of choice” is the freezer stocked very full with meat bought in bulk from local farmers. I also stock up on dried fruit, nuts, coffees, teas, and canned goods like tomatoes. That is a pretty pantry! Love your pantry and suggestions on stock. I try to buy my sugar, flour (all kinds) and rice in bulk. Then store in large canisters on pantry shelves. Prices are going up dramatically in the stores. I try to keep on hand evaporated and condensed milk, olive oil, beans (dry and canned), broths of all kinds, spices (dried from garden or from store). I was also going to add instant box milk to my pantry, until I seen the price $15.00 for a small box (the price almost gave me a heart attack). Thank you for sharing, I enjoy your blog. 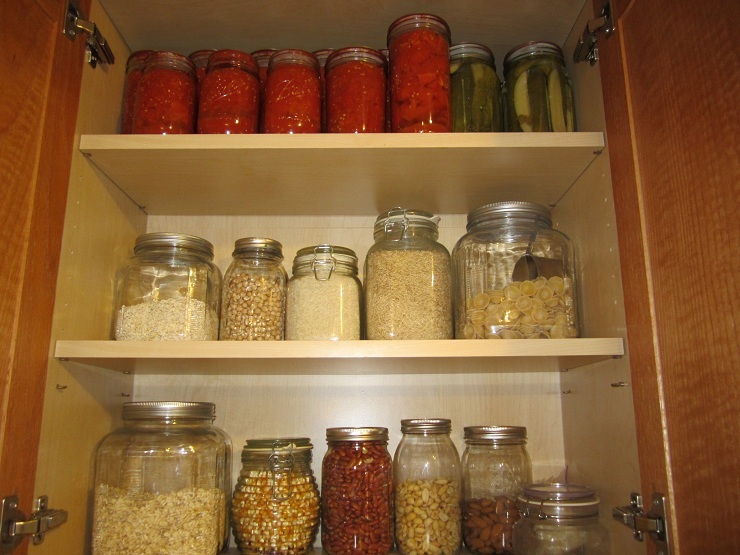 This is one of my goals for this snrpig — to get our pantry organized so I can feel more in control of what we buy (or don’t buy) from week to week! Thanks for the very useful information!I’m a new follower. Onions can be chopped and frozen more or less indefinitely. Of course, you probably go through them quickly enough, but it never hurts to keep a backup. Wow, my pantry has a twin. Jk, I have a dehydrator so I always have onions. I also keep lots of barley around and Braggs liquid aminos instead of soy sauce.